This past November, National Geographic Traveler Magazine celebrated its 30th Anniversary. The magazine was launched in order to ” ‘inspire members [of the National Geographic Society] to go and experience [destinations],” complementing National Geographic, “which has taken its readers to places most of us will never reach. '” This is quoted from the editor’s note in the November 2014 edition, quoting National Geographic editor Gilbert M. Grosvenor‘s editor’s letter from the first magazine launch in 1984. You can see the picture on my web site here or on National Geographic Traveler’s site here. Aloha! While I was on assignment last August in Honolulu for National Geographic Traveler Magazine, I was fortunate enough to have a few things that had to be photographed either from or in the water. One of the images I thought would be interesting to make is the classic photo of the traditional Hawaiian outrigger canoe rides with Diamond Head in the background. This has been an iconic image of Waikiki since the early twentieth century as evidenced by a story that ran in the New York Tribune in 1908. Honolulu has changed enormously since then, however the ocean and the waves, along with the geologic feature of Diamond Head, remain intact. When I arrived on Oahu, I decided to head down to the beach and try to figure out a way to get in the water on a surfboard with a giant water housing and surf alongside the canoe. 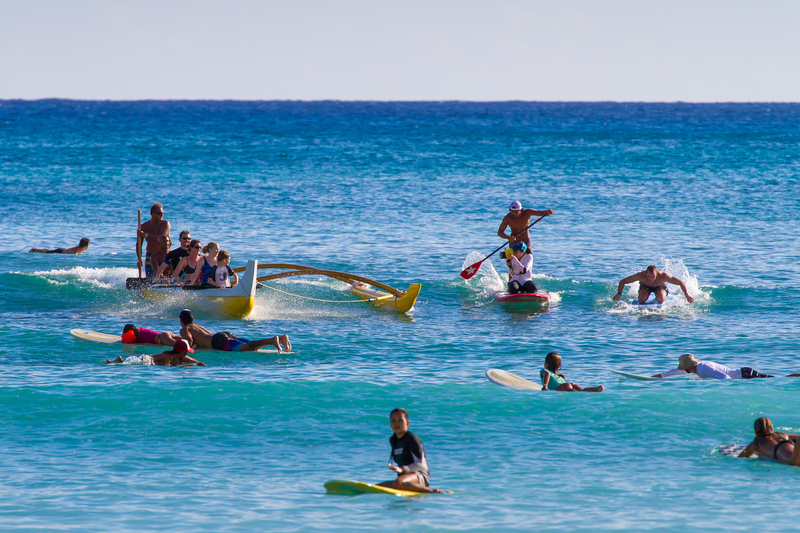 Outrigger Canoe rides are one of many attractions for tourists on Waikiki Beach in Honolulu, HI. 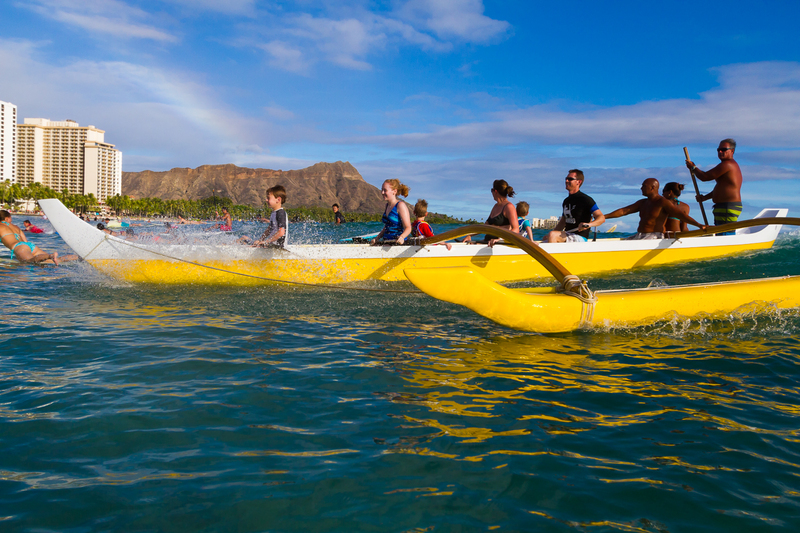 Waikiki is one of the only places where anyone can ride waves in traditional outrigger canoes. The locals are one of the most invaluable resources to a travel photographer. We, the photographers and journalists, get our names placed in the magazine, but I’m of the opinion that we all owe a tremendous amount of gratitude to the people who are open to sharing their knowledge and expertise with us, the interlopers. Waikiki turned out to be no exception. I surf – a little – but not nearly enough to be able to safely operate a surfboard and camera in the crowded line up at Waikiki. When I got to Waikiki Beach, I stood in the middle of the crowd and hung around, watching to see who was the best stand-up paddle surfer. One man stood out immediately. He could easily navigate the crowds, he caught wave after wave and it was clear that he knew his way around the ocean. When he came out of the water, I asked if he’d be interested in taking me out on his SUP so that I could make pictures. Without hesitating, he said, “sure thing,” and the next thing I knew we were off for a test run. I had brought my GoPro with me to take a few test shots and also to see what it would feel like to sit on the front of a surfboard while making pictures. The test shots were a success, so we made an appointment to meet up the next day and arrange with the outrigger for us to follow them while they took out their last round of tourists towards the end of the day when the light would be good. It was a fantastic experience to ride the waves and be able to concentrate on composition and lighting while the driving was taken over by the talented local beach boy, John Paul. Here are two behind-the-scenes pictures to illustrate the crowds and how I had to ride on the front of the board shooting with a Canon 7D in an underwater housing as JP navigated us through the crowds. I’m sitting on the front of the paddleboard, as JP navigates us along side the outrigger canoe, all the while trying not to get into a wreck! 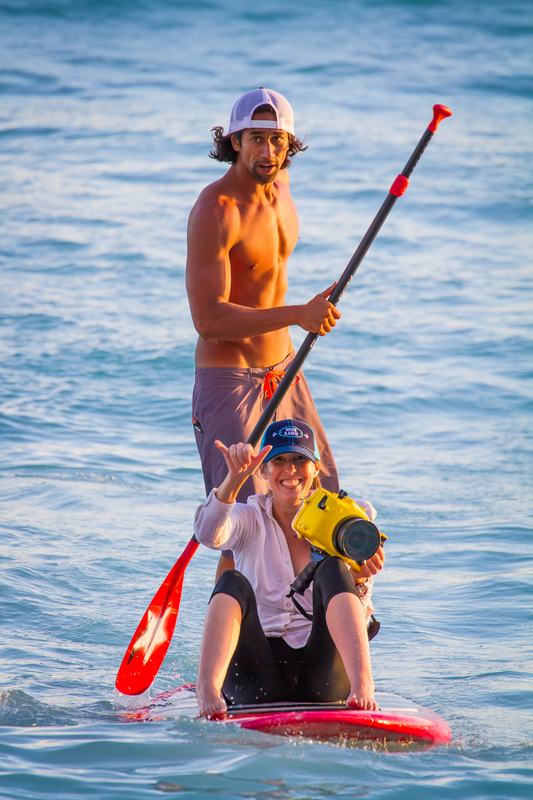 JP and I coming in at the end of our photo shoot with the outrigger canoe. Aloha!!! It is my great pleasure to announce that I am the proud recipient of an award from the North American Travel Journalists Association, known as NATJA, for excellence in photography in the category of portraiture. The winning story is called, “It’s a Wonderful Life.” It was published in the January/February 2011 issue of National Geographic Traveler Magazine. I received my letter from the association today which states that, “This year’s competition was marked by an overwhelming number of outstanding entries. As an award winner, you were singled out as one of the best of the best.” 🙂 Thank you NATJA and National Geographic Traveler! opening spread for, "It's a Wonderful Life" story by Charles Kulander, photographs by yours truly. Click here to be taken to a gallery of some of my other favorite photos from the shoot. National Geographic Traveler Magazine senior photo editor Dan Westergren posted today his selects for the top 10 photos from 2011 and I was pleasantly surprised to be included. 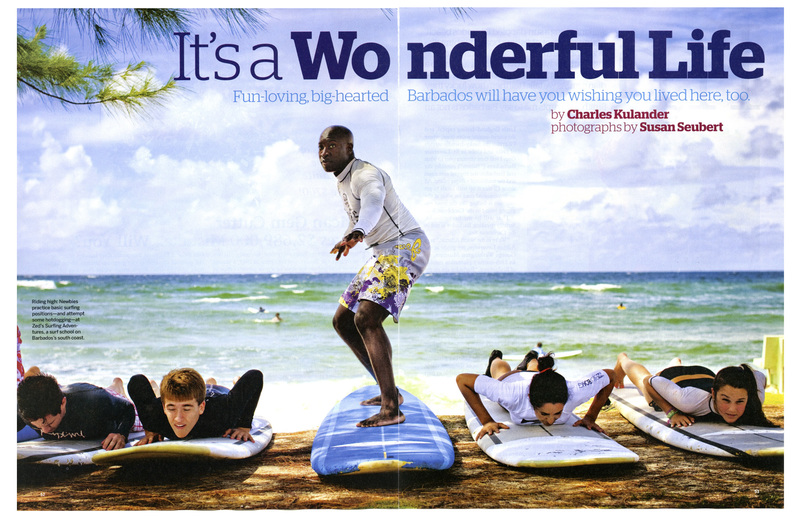 The selected photo was from a shoot at Zed’s Surfing School in Barbados, which was the opener for a story I shot about the island nation that ran in the January/February 2011 issue of National Geographic Traveler. I completely agree with Dan about having the subject in the center of the frame, usually considered to be a visual no-no. I had been lying on the ground shooting, trying to capture a moment of the lessons that are given before entering the water, a very typical event, but often not the most dynamic time to shoot. Later on, as I was reviewing the images from the take, this one immediately caught my eye and was marked as a file select. My husband, who ran a major photo gallery for ten years, remarked that it has the appearance of a diorama. It’s always thrilling to be assigned such wonderful stories. However, when pictures from those assignments receive singular recognition, particularly when the image is culled from thousands of others that were submitted or published over the year, the excitement is even greater. It’s also an honor to be included among the other 8 fantastic photographers, including Frans Lanting, Catherine Karnow and Chris Rainier. Thank you National Geographic Traveler!!! Aloha All! Just a brief post to update my location. I’ll be based at Kaanapali near Lahaina on the island of Maui until November 22. After completing my first two assignments, I am back in the water, surfing. The weather, as usual, has been stunning with days filled with sunshine, trade winds keeping the temperatures perfect, and always a little swell in the water just outside my island home. Mahalo for reading and a hui ho!